The Chimney Murder by E.M.Channon An immersive domestic crime? This novel seems to be at first glance quite a domestic mystery. With a thoroughly disagreeable man at the centre, who strikes fear into the heart of his family with his unreasonable temper, it seems a murder would in some ways be a logical outcome. There is nothing so straightforward in this gripping book originally published in 1929, more recently reprinted by Greyladies, which was written by Ethel Mary Channon. Instead of a large country house, this unusual murder mystery is set in a small suburban house, with the interest and involvement of several neighbours. It manages at once to feel claustrophobic, tense and ominous. Strange events make everyone in this novel doubt their family, friends and neighbours. There are many secrets to be revealed, as well as some heartfelt longings and regrets. People change, others find their true selves, and the murder is far more than a cosy puzzle when everything hangs in the balance. The men in this novel are largely revealed as less than capable, whereas some of the women find their strength of purpose. Nothing is easy in a book which feels so possible in its reasons, even if the execution seems a little messy. Mr Harbottle Binns is an ill tempered man, whose frequent mood changes cannot seemingly be averted by his wife, despite her continued attempts to placate him and prevent his fearsome outbursts. He shows cruelty and ill manners to many, especially his family, but even his quiet, poor neighbours suffer from his often unreasoning complaints. When his family sneak out for the day, careful not to leave a trace, his latest outbreak means that various members of his family discover why fires cannot be lit. A messy murder exposes awful characters, dreary characters and no little pain. As Selina, always called Mrs. Binns, discovers a strength which she has been keeping quiet under her husband’s oppression, her children are left confused. Nice touches, including humour and romance, are threated through the book. This novel full of incident, red herrings and strong feelings is essentially a family, domestic novel, with everyone under suspicion. As a young couple find each other, and a sense of purpose is rediscovered, secrets emerge and must be concealed. There is a neat ending, when truly every character works out what really counts in life. This is a strongly written, closely observed narrative, full of the domestic details which makes even a horrific murder seem more real. I found it a brilliantly written novel which seized my interest, as soon as the older women became stronger in the face of family tragedy and fear. This book’s unexpected strength emerges as the female characters, especially the older women, are forced to take control. Even the noisy and negative neighbour has her day, or days, as she revels in her special insights in masterly monologues. This novel in some subtle ways is ahead of its time in terms of its immersive achievement and recognition of the roles of women, in direct contrast to some other novels of this period who are not so able to admit women can be protagonists in any real way. At first I was less than impressed, thinking that the cowering wife and dominating husband showed that this would be another book of a straightforward murder mystery. However, I soon discovered that this was a far more clever narrative than that and I could not be easily parted from this book. The mystery is not complex, but the way of working things out is fascinating, and the characters are simply memorable. I am so impressed by the books that Greyladies have reprinted. I have an idea that I read somewhere that they are relaunching their website this summer, so I hope that this means more choice of reprinted gems. Meanwhile, I am still discovering more books to read and review. I am greatly enjoying the new Alison Weir novel “Jane Seymour The Haunted Queen” in Her Six Tudor Queens series. I am looking forward to hearing her speak at the Derby Festival; after last year I am expecting a torrent of information! 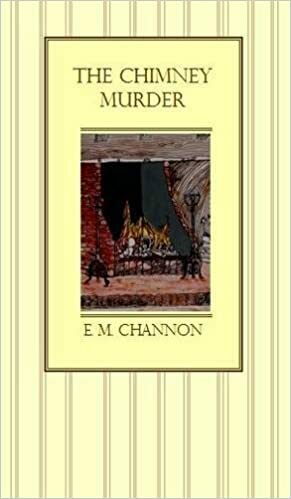 6 Comments The Chimney Murder by E.M.Channon An immersive domestic crime?